This week the confiscation case against former Prime Minister Gerrit Schotte is taking place in Curaçao. The Public Prosecutor (OM) wants to take away from him the 1.8 million guilders he would have received in a bribe. The process provides a revealing glimpse into the dark financial trade and walking of a prime minister who was willing to sell control of his country to Mafia types. WILLEMSTAD - Former Prime Minister Gerrit Schotte has another 3 years extra hanging above his head. Today, the court in Willemstad is continuing the confiscation case against the politician. The public prosecutor wants to take away 1.8 million guilders from Schotte which he received as a bribe. If the judge grants the claim, and Schotte does not pay - he says he only has debts - the Public Prosecutor wants him to be put behind bars for three years. Last year, the court sentenced the politician to 3 years in prison for accepting bribes, but because he went into cassation, he is still walking around free. The criminal case is about 213,000 dollars which Schotte received via a bank account in Miami from the casino boss Francesco Corallo in exchange for political influence. The amount of 822,640 dollars was also added by the OM. On August 9, 2010 (less than 3 weeks before the election in which Schotte won 5 seats with his new party MFK), International Financial Planning Services Ltd transferred it to the Swiss bank account of No Brand Ltd. The first is from the Atlantis World Group of Corallo, the second is a Marshall Islands based company of which Schotte is the owner. Corallo, who is affiliated to the Sicilian Mafia denies payment but the recipient does not. That does not make any sense either: the Public Prosecution has bank statements and credit card details. Schotte claims that he has done more than 8 hundred thousand dollars of work for that person. He would have carried out an assignment for a project developer in 2007 and 2008. He wanted to build a villa park in the area of Knip and asked the then Island Council member for a feasibility study. The Public Prosecution has no doubt that it is a bribe. For example, Schotte cannot mention the name of the project developer, but he refers to 'investment companies', which, as appears from inquiries, are mainly concerned with devising constructions to avoid or evade taxes. From a plan for a villa project at Knip, nobody in Curaçao has ever heard of. Schotte cannot show documents that substantiate his reading: there is no correspondence, no quotation, no contract and the feasibility study cannot be found. The Public Prosecution does not believe it credible that Schotte, in addition to his regular work and membership of the Island Council, had time to work for 150,000 guilders per month. Moreover, this compensation is not in proportion to the claimed effort. There is no invoice and the payment was also made only 2.5 years later. 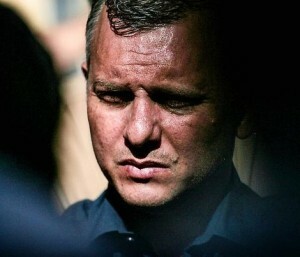 The fact that Schotte concealed this income for the tax and also failed to state on his declaration the balance on the Swiss bank account confirms, according to the Public Prosecution, that the income received was 'unlawfully'. The money was also channeled to banks in Cyprus, Lithuania and Isla of Man to eventually get in the hands of the former prime minister. On the first day of the session, Schotte mainly tried to show that he personally did not get better. He used the money for debt repayment, the financing of his political party and his 'charitable foundation' Fundashon Gerrit Schotte. In confiscation cases, however, it is only relevant whether money was obtained lawfully or illegally and not how it was spent. Lawyer Geert-Jan Knoops, therefore, takes a different approach. Apparently he also sees that there is nothing intrinsically against the abundance of evidence and he tries by procedural means at least postponement of execution to delay the case. Knoops thinks that the judge must wait for the judgment of the Supreme Court. As long as there is no irrevocable judgment his client is actually not guilty of corruption. The session will be continued today. Knoops has announced that he needs five hours to convince the judge to reject the confiscation request, but probably not even five hundred hours will be enough.